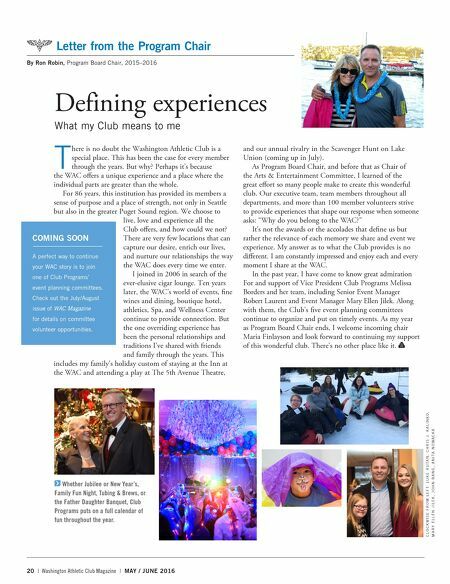 20 | Washington Athletic Club Magazine | MAY / JUNE 2016 Defining experiences What my Club means to me T here is no doubt the Washington Athletic Club is a special place. This has been the case for every member through the years. But why? Perhaps it's because the WAC offers a unique experience and a place where the individual parts are greater than the whole. For 86 years, this institution has provided its members a sense of purpose and a place of strength, not only in Seattle but also in the greater Puget Sound region. We choose to live, love and experience all the Club offers, and how could we not? There are very few locations that can capture our desire, enrich our lives, and nurture our relationships the way the WAC does every time we enter. I joined in 2006 in search of the ever-elusive cigar lounge. Ten years later, the WAC's world of events, fine wines and dining, boutique hotel, athletics, Spa, and Wellness Center continue to provide connection. But the one overriding experience has been the personal relationships and traditions I've shared with friends and family through the years. This includes my family's holiday custom of staying at the Inn at the WAC and attending a play at The 5th Avenue Theatre, and our annual rivalry in the Scavenger Hunt on Lake Union (coming up in July). As Program Board Chair, and before that as Chair of the Arts & Entertainment Committee, I learned of the great effort so many people make to create this wonderful club. Our executive team, team members throughout all departments, and more than 100 member volunteers strive to provide experiences that shape our response when someone asks: "Why do you belong to the WAC?" It's not the awards or the accolades that define us but rather the relevance of each memory we share and event we experience. My answer as to what the Club provides is no different. 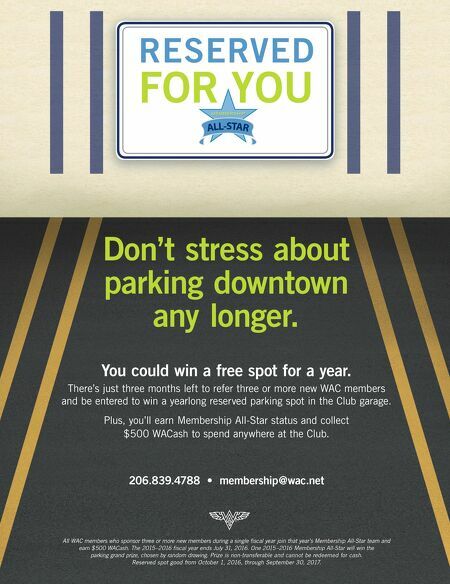 I am constantly impressed and enjoy each and every moment I share at the WAC. In the past year, I have come to know great admiration For and support of Vice President Club Programs Melissa Borders and her team, including Senior Event Manager Robert Laurent and Event Manager Mary Ellen Jilek. Along with them, the Club's five event planning committees continue to organize and put on timely events. As my year as Program Board Chair ends, I welcome incoming chair Maria Finlayson and look forward to continuing my support of this wonderful club. There's no other place like it. Letter from the Program Chair By Ron Robin, Program Board Chair, 2015–2016 C L O C K W I S E F R O M L E F T: L U K E R U TA N , C H R I S J . K A L I N K O , M A R Y E L L E N J I L E K , J O H N B A N G , A N I TA N O WA C K A Whether Jubilee or New Year's, Family Fun Night, Tubing & Brews, or the Father Daughter Banquet, Club Programs puts on a full calendar of fun throughout the year. COMING SOON A perfect way to continue your WAC story is to join one of Club Programs' event planning committees. Check out the July/August issue of WAC Magazine for details on committee volunteer opportunities.